He spills the coffee bringing in. The cardboard is soaked, smelling strongly of mocha, and when he brings it in she crooks her eyebrow at him. She does not seem surprised. When she speaks her voice is laced with disappointment. "It's ruined," she says, and he wants to take the coffee and dump it down the drain. It used to not be like this. She used to greet him with smiles. The patter of her feet, as she ran up to him. "For me?" she would say, feigning surprise, even though she knew that he would make this trip for her. He would get into the car and put the key in the ignition and drive through the Dhaka traffic to the café she liked. He would, get in line and jingle his keys and tap his foot on the pumpkin-coloured tiled floor as the kohl-stained teenagers ahead of him popped gum and punched the keypads on their cell phones. He would look up at the menu that he had already memorised from his many trips here, look at the bored barrista behind the counter who would take down his order with a desultory "Anything else, sir?" before turning away to whip up his order. And while he waited he would look at the platters of brownies and cakes behind the glass display and think to himself, "What is she in the mood for today?" And then he would drive back, the radio on, the brownie or the sandwich balanced precariously on his lap, the coffee in the cupholder, tapping his fingers on the steering wheel and picturing the expectant look in her eyes. And now, this. She looks into the paper cup, half empty now. She sniffs at the sandwich that now smells like mocha. "What am I supposed to do with this now?" she mutters, not to him, looking instead at the soggy bread and the lettuce that is wilting in the summer heat. He doesn't have the answers to her questions. Not these, and not the other ones. She had asked questions the night he stumbled across the living room, kicking off his loafers, missing the couch, falling into a heap against the coffee table. She had led him to the bathroom, watched over him as he emptied the contents of his stomach into the toilet bowl. She had sponged his burning forehead with a wet cloth, and then she had told him never to talk to her, never to bring his alcohol-tinged breath near her face, and how dare he come to her in this state. She had walked away, the slam of the door too loud for him in his stupefied state. What had she meant? But he had not stayed awake long enough to find out. Now these little surprises don't surprise her anymore. The mocha and the brownies, periodically left by her bedside table or on her side of the kitchen counter. She glances at them, finds fault in them, and in her downturned frown he sees the ocean of disappointment. He leaves the paper cup by her table. That night, on his way to the bathroom, he sees it half-empty. "What came first, the chicken or the egg?” The murgi-obsessed Physics teacher asked loudly. “It was probably the chicken,” Someone said thoughtfully. Before the debate could start off properly, it was interrupted by a flying egg. Now, I'm sure all of us have had our share of wanting to egg someone or something. And every kid in this generation has gone through the mixing-random-liquids-and-powders-to-see-what-happens-phase. Put the two (and aforementioned Physics teacher) together and you have a host of egg-related Physics experiments. The first thing that comes to mind when thinking about Physics: Newton's Laws of Motion. Yeah, they made our lives hell in the early classes with the mass and acceleration and resultant forces. Not to mention Newton's Third Law: every action has an equal and opposite reaction (force). Well, that's the basic gist of it. But Newton's third law makes for the most amazing experiment: The flying egg. Requirements: Egg, basketball and lots of space. Put egg on basketball in such a way that it doesn't fall off. Drop basketball. The ball exerts a force on the ground and the ground exerts an equal and opposite force on the ball. The ball exerts a force on the egg and it goes flying off. It is highly recommended that you do NOT do this indoors. Requirements: Egg and two shot glasses. You angle the egg and place it in a shot glass. A normal wine glass will do, although then you're going to have to make a tiny hole in the egg and take all the yucky stuff out of it. You put the two glasses a reasonable distance away from each other (a couple of inches) and blow into the far side of the glass. The egg jumps out of the glass and into the other glass due to a build up of pressure. Put egg in bowl and cover in vinegar. Leave it in the fridge for 24 hours. Then take it out, replace the vinegar with fresh vinegar and leave it in the fridge for 24 more hours. In the end you get a raw, shell-less egg. Theoretically the egg should be able to bounce... but it doesn't work all the time. So it may splat at the bottom of your bottle. Requirements: Egg (Shell-less), burning piece of paper or cardboard or match and bottle. The diameter of the bottle neck has to be only slightly smaller than that of the egg. Put the burning whatever-you're-using in the bottle and quickly place the egg on top the bottle opening. When the flame goes out, the egg will squeeze through the neck and drop to the bottom. See, when the air in the bottle is heated, it rises and leaves the bottle through the neck (you may see the egg jump). This causes a pressure difference and the now-extra pressure outside the bottle forces the egg in. You can also make an egg float on water if you add enough sugar to the water. It increases the density of the water. Eggs can be used to demonstrate Bernoulli's Principle and even measure the speed of microwaves in a microwave oven. (That one's kind of long and it's not all that interesting. It just sounds cool.) 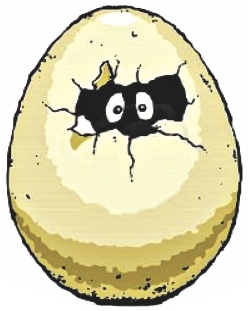 Of course, if you're going to put eggs in an oven, you might as well try the exploding egg trick. Christopher John Francis Boone, the narrator and protagonist of the novel is a fifteen-year old autistic savant who “knows all the countries of the world and their capital cities and every prime number up to 7,057” but fails to understand the complex behaviours and demands of the adult mind. He hates the colours yellow and brown, is a science and math genius and does complex math problems in his head to pass time or distract himself from unpleasant situations. If people touch him, he hits them. He does not understand expressions because they happen too fast for him, despises crowds and when his brain is confused and his senses overloaded; he curls up into a ball and groans loudly, for hours at a time. He lives with his father because he was told that his mother had died, though he never saw her at the hospital. His world needs order and precision down to the minute details. One day, he discovers the corpse of his neighbour's dog, Wellington, impaled by a pitchfork. Following the footsteps of his favourite detective Sherlock Homes, he decides to investigate and write a book about it. The murder of the dog acts as a catalyst and sets him on a quest that leads him to uncover unimaginable secrets about his own family and sends him on an adventure that challenges all of his abilities to understand and cope with the world that he struggles to comprehend. 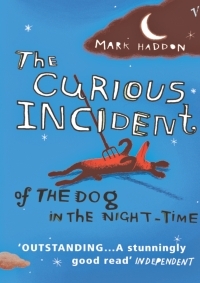 The Curious Incident of the Dog in the Night-time is not a book just about disability. Written from the point of view of an autistic individual, it shows how even when he can be extremely frustrating, Christopher's explanation of the world makes perfect sense and provides a different perspective on the idiosyncrasies of man, where adults can often act just as childish and stubborn as children. Simultaneously, it makes us sympathise with the adults around him, who have to possess an extreme level of patience to handle him and it shows us the great degree to which his illness affects all of their lives. "Prime numbers are like life. They are very logical but you could never work out the rules, even if you spent all your time thinking about them." All the chapters of this unique book are numbered as prime numbers and the inclusion of diagrams, maps, timetables and even math problems make the book a delightful, different read and crosses the normal capacity of novel writing to illustrate how richly the autistic brain works. It is a book both for adults and children, for in spite of the clear and simple way it was written, its scope reaches many different levels of the human mind. It is a book that needs to be on everyone's reading list.